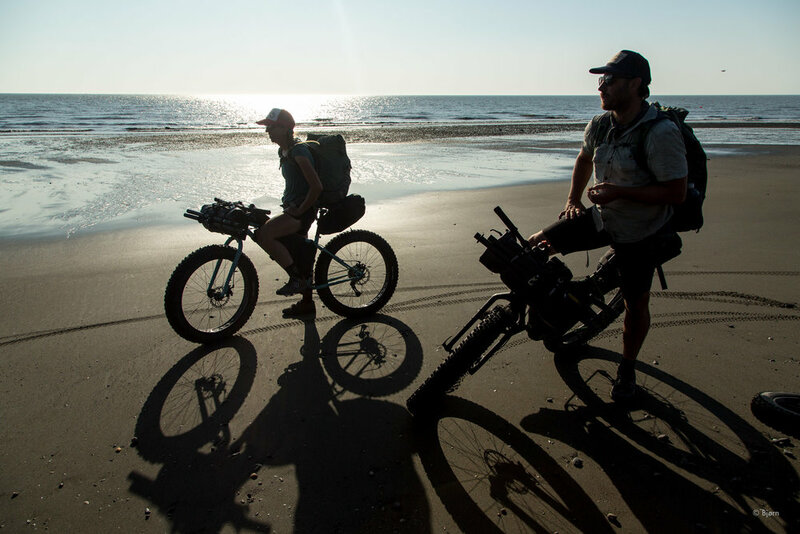 Bjørn and Kim pause for a rosy sunset on a 2016 fat-bike expedition from Nome to Kivalina. 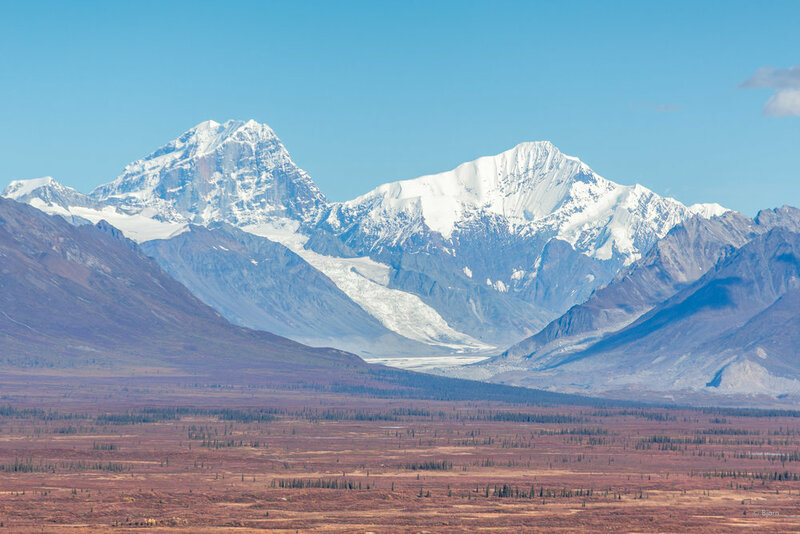 On March 14, 2018, Kim and I fly to Nome, Alaska, with the intention of riding our bicycles to Fairbanks, on the greatest equipment the world has yet seen. 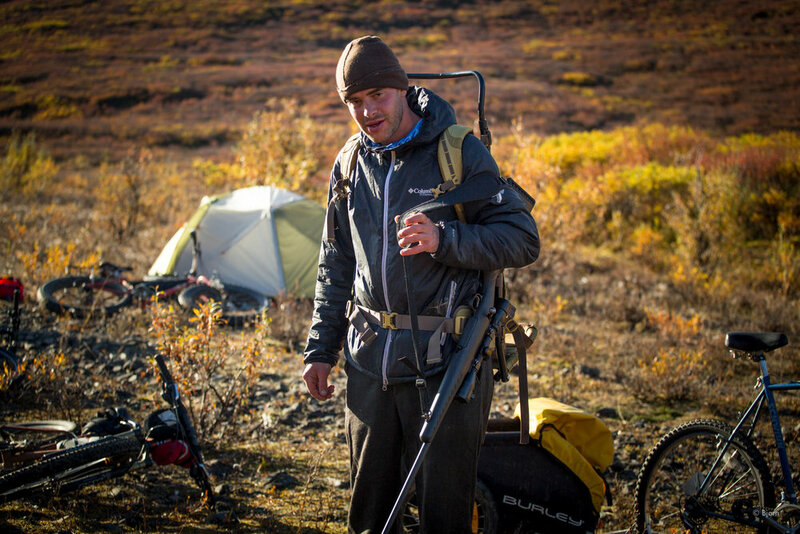 The fat-bike is a marvel of modern industry and design. Man’s greatest invention—the bicycle—has been fussed over, considered, and modified into a thing of beauty and unrivaled efficiency. Winter cycling expeditions can be really hard. Soft snow trails, strong and sometimes relentless wind, discomfort, and injury are all potentially on the menu and to be anticipated. In the late 1990s, winter cycling expeditions had the potential to be even more difficult—fat-bikes didn’t yet exist. 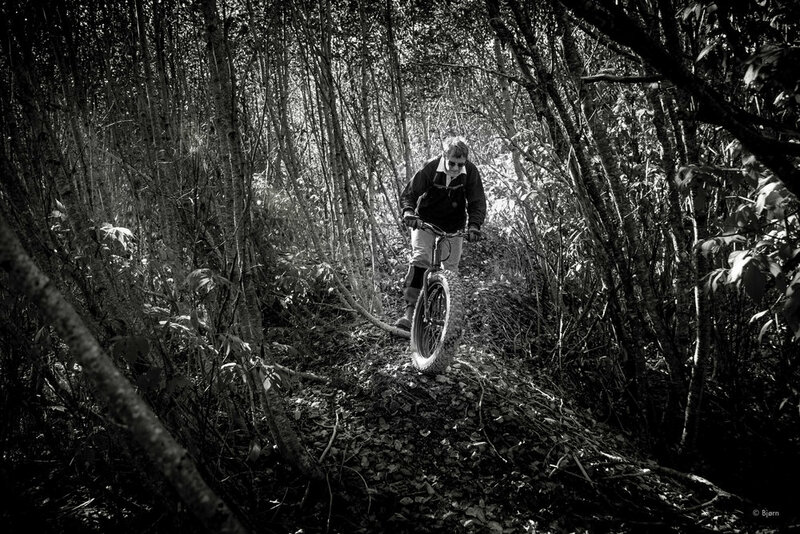 Even with big tyres, these trips are often impossible; without big tyres, impossible was more frequent. In the 1980s, 1990s, and well into the 2000s, a handful of diehard winter cyclists were begging for bicycles with bigger, wider, and fatter wheels and tyres. Shade-tree inventors like Mark Gronewald and Ray Molina were pushing the boundaries but the options were few. Finally, however, one bigger bike company took a chance, made the leap of faith, and kicked off the fat-bike design arms race. 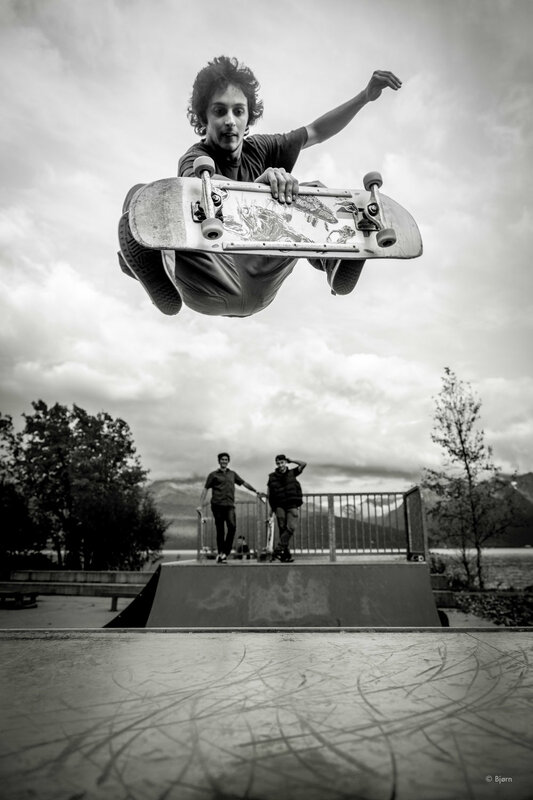 Since 2005, interest in this sub-culture cycling pursuit has grown exponentially. What used to be a sport wherein everyone who did it knew the name and or reputation of almost most everyone else, has mushroomed into a global phenomenon. 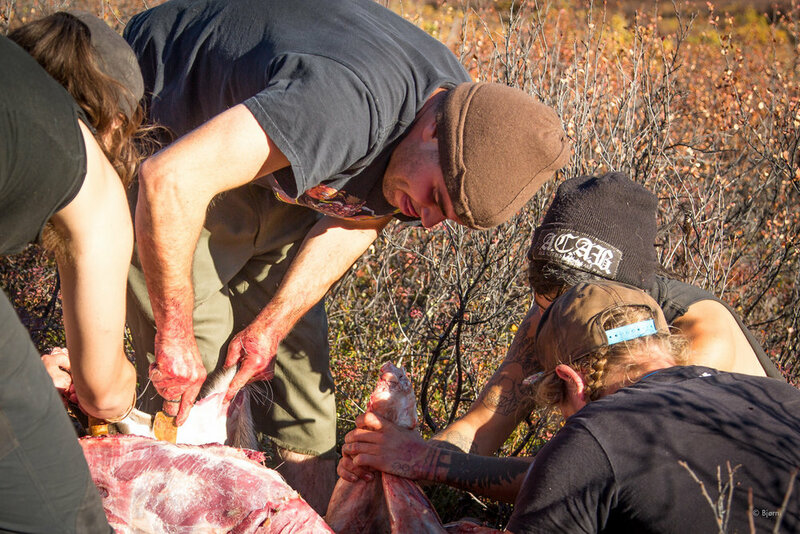 Alaska has exported an idea and an activity to the world, and there is no going back. And, since 2005, the cycling industry has been in overdrive, designing and tweaking the equipment. 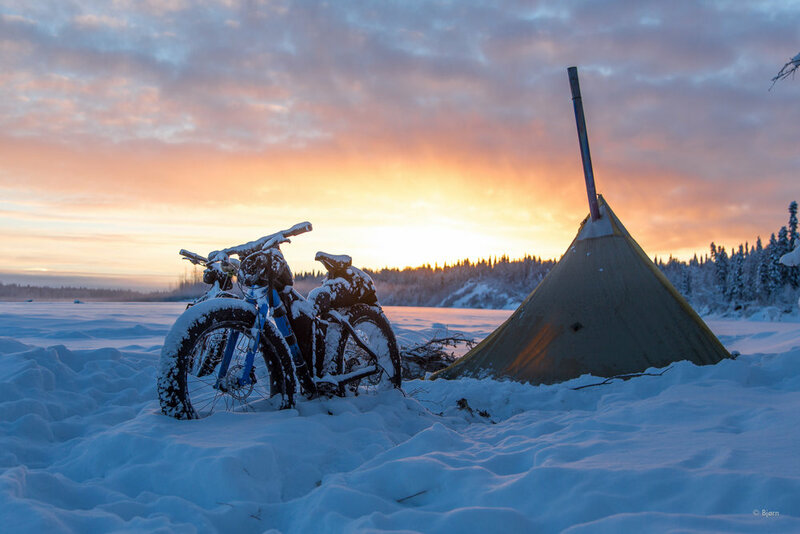 To the engineers and designers, who have lost sleep, listened to input, and spent long hours in the saddle wondering how to improve the fat-bike, thank you. To the OG’s who spent their inheritances and re-mortgaged homes on the original fat-bike dream, thank you. Twenty years ago, I took my first winter cycling trip on the Iditarod Trail with Roger and Arleen Cowles. My mind was blown. We were on the equipment of the day and we didn’t achieve the massive objective we’d set out for. We made it to Unalakleet and called it. Tomorrow, I fly with my favorite adventure partner, Kim McNett, to Nome, again. We intend to hang around for a few days and take in the finish of the Last Great Race, visit friends, and camp on beaches dripping with gold and history. On this trip, I plan to shoot video. I want to ask anyone we meet, how global warming has affected their ability to travel. For ten thousand years, winter has been the time for travel and human migration; winter has been the time to visit distant family and to reconnect. On our watch, this tradition is disappearing, unless we get serious and start fighting like hell against global warming. Our messages will be sent to Kim’s Facebook page as well as Ground Truth Trekking’s Facebook page. 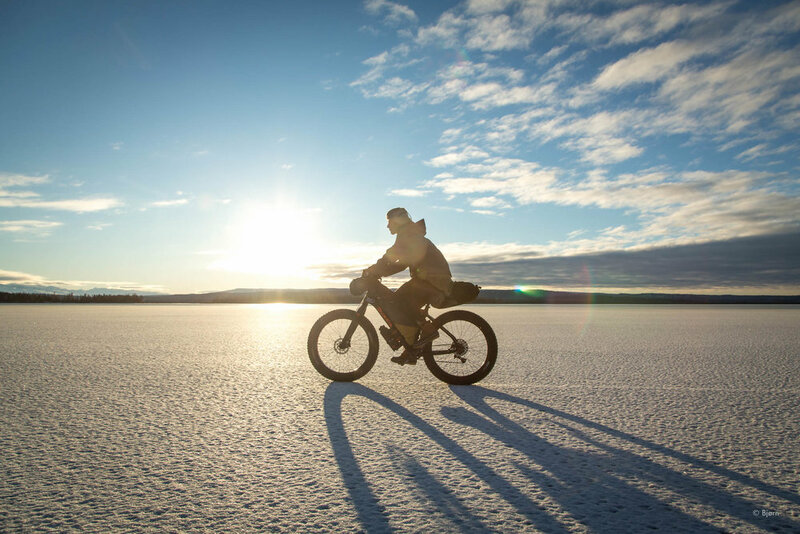 Our bikes have been tuned; our bags packed; our batteries full of charge; and there is nothing left for it. We are as ready as we’ll ever be. Wish us well. A big shout-out to our gear sponsors, Salsa Cycles and Mountain Laurel Designs. Also, a big shoutout to the authors of Drawdown for giving me reason to hope. Salsa Mukluk leaning on bowhead whale bones in Point Hope, Alaska. Reflecting on 2017, one word comes to mind: unbelievable. It’s unbelievable that I should be so fortunate; to have friends and family of whom I draw so much from and am eternally inspired by. These people within my sphere seem incapable of thoughtless compromise and live under their own enchantments. My vibrant, supportive, and engaged community is filled with unbelievable brilliance, creativity, and steely-eyed determination to fight the good fights. 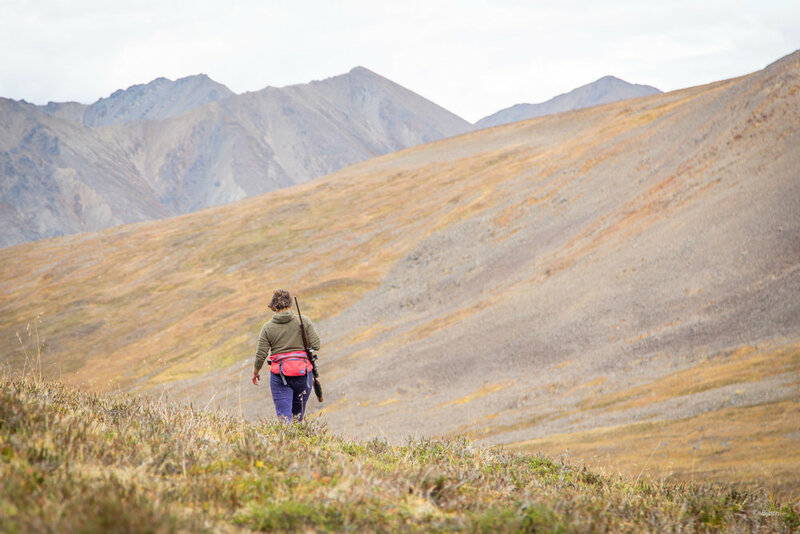 It is unbelievable that I was, again, able to experience so many new, wild, and remote areas of untamed Alaskan wilderness. 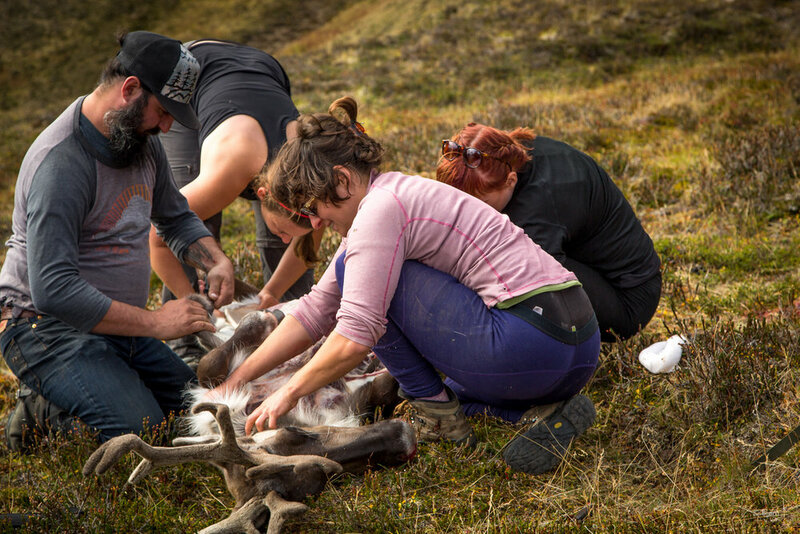 Traveling through Arctic Alaska last summer was one of the most rewarding and eye opening expeditions of my life. 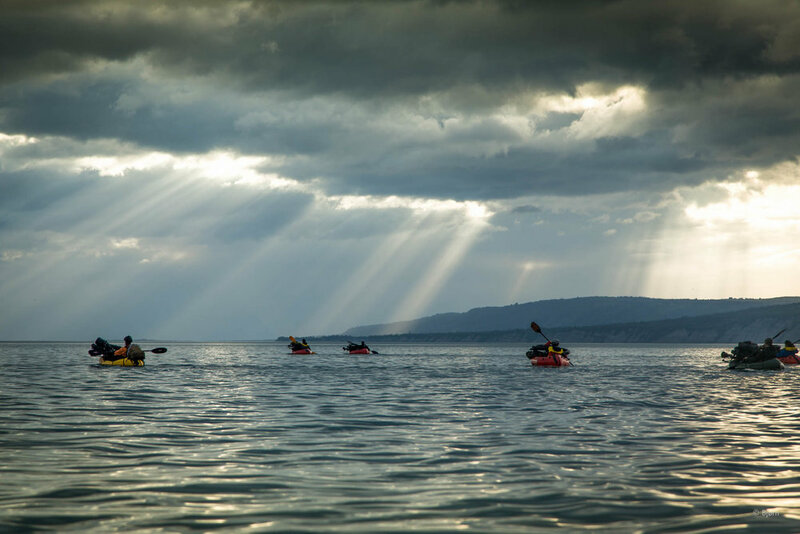 The shorter ventures by bike, packraft, and kayak were all, also, unbelievable. 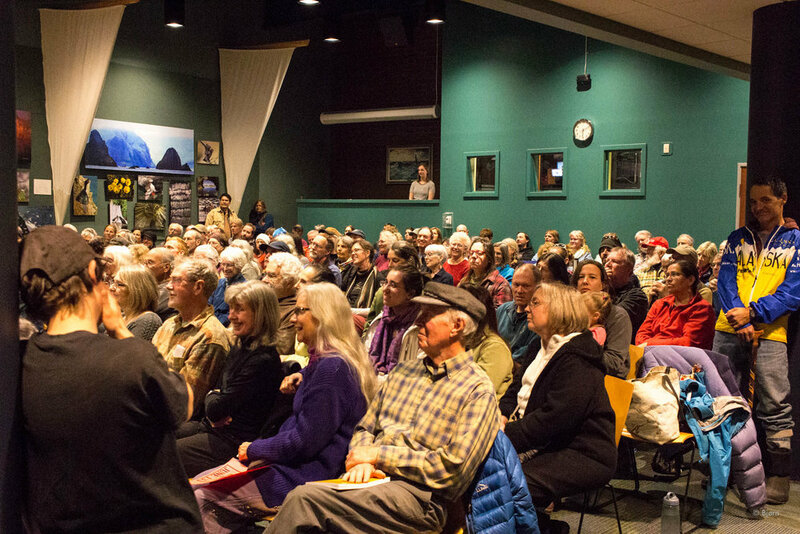 The flood of support, input, and collaboration regarding the Alaskan climate change education campaign has been unbelievable. Three years ago, I made a New Year vow to become a better climate change communicator and not miss opportunities to learn and share. That vow still stands. Perhaps it runs. In 2017, we have had to march and protest against systemic and swelling racism. Unbelievable! We had to march, organize, strategize, and mobilize to protect and stand up for science. Unbelievable! We have had to march and stand up for the rights of women. Unbelievable! We have a racist, anti-intellectual, sexual predator for a president who endorses pedophiles. Unbelievable! Late in 2017, the UN released a report claiming that America—despite being one of the wealthiest countries—is the most economically unequal society in the world. My country spends more on national defense than China, Saudi Arabia, Russia, the United Kingdom, India, France and Japan combined and has been at war for 16 years! Unbelievable! 2017 was the warmest year on record without an El Nino. Each of the 10 hottest years on record has occurred since 1998. Despite overwhelming scientific consensus as to why rapid global warming is occurring, 2017 set a record for fossil fuel consumption. Unbelievable! One of the hardest things for me to reconcile about 2017 has been the disparity between the micro and macro. On the micro level—meaning my community—the fight for justice and right-headedness was in overdrive. On the macro level, autocratic, small-mindedness, with strong overtones of fascism, clutched our national politics. 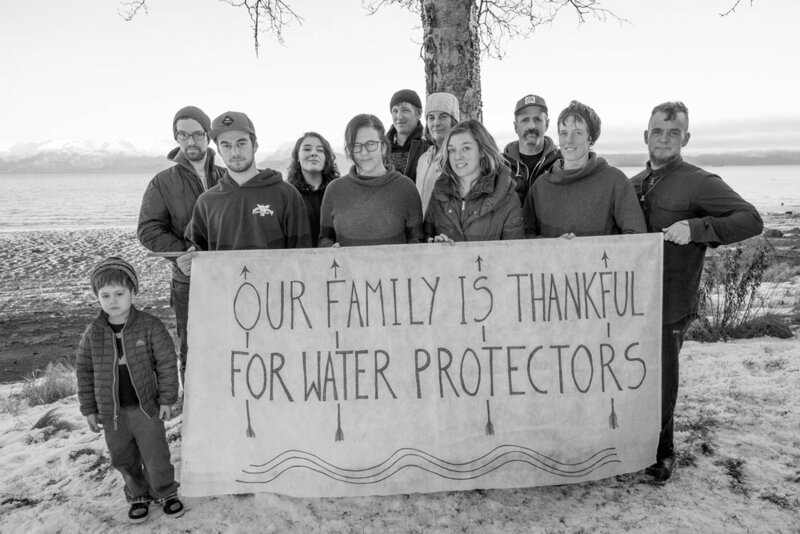 This observation brings to mind Margaret Mead, who said, “Never doubt that a small group of thoughtful, committed citizens can change the world; indeed, it's the only thing that ever has.” This, I believe. Happy New Year, everyone. May your optimism wear big boots and be louder than ever. Below, is smattering of photos from 2017. 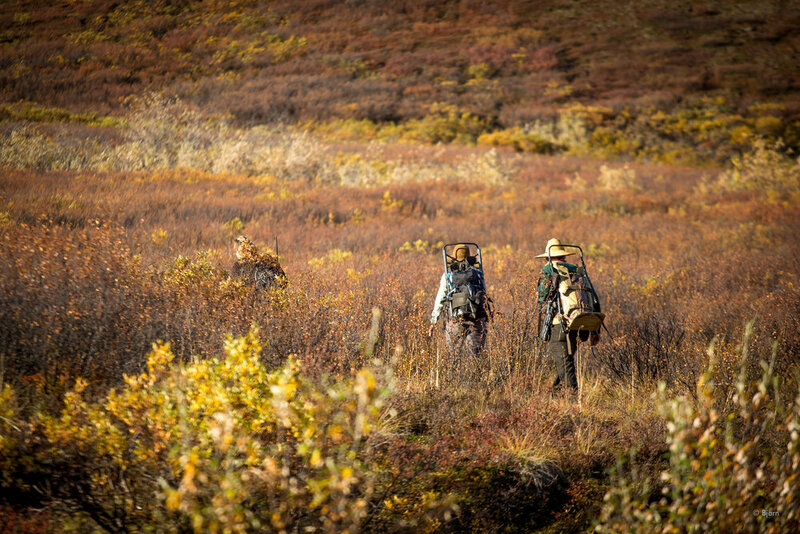 Alayne and Daniel cross the Lisburne Hills - Arctic Alaska. 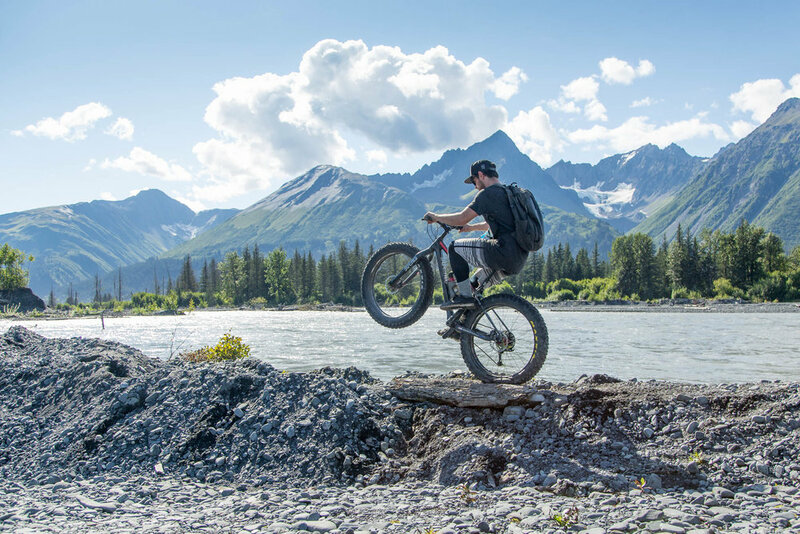 Noah rides a wheelie near Resurrection River - Seward, Alaska. Winter bike camp - Caribou Hills. Alayne and Kim find a walrus skull - Arctic Alaska. 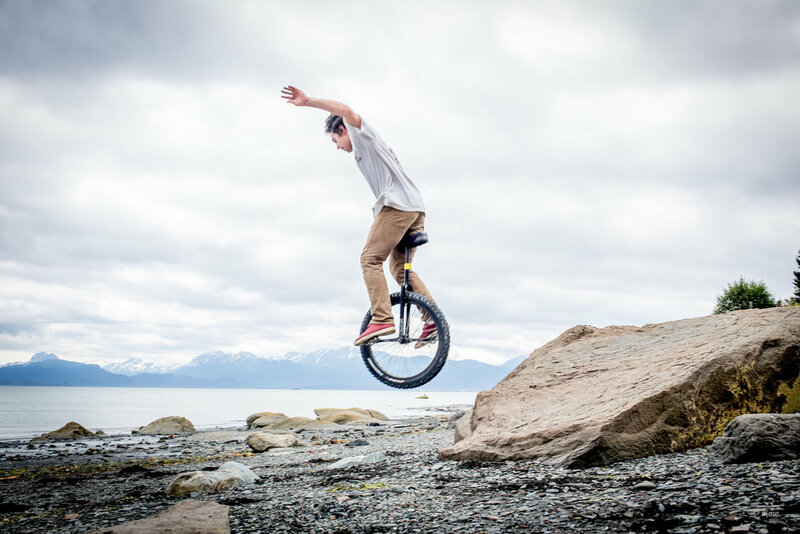 Homer Cycling Club's Big Fat Bike Festival - Homer, Alaska. Sammy learns to ride a fat-bike - Homer. 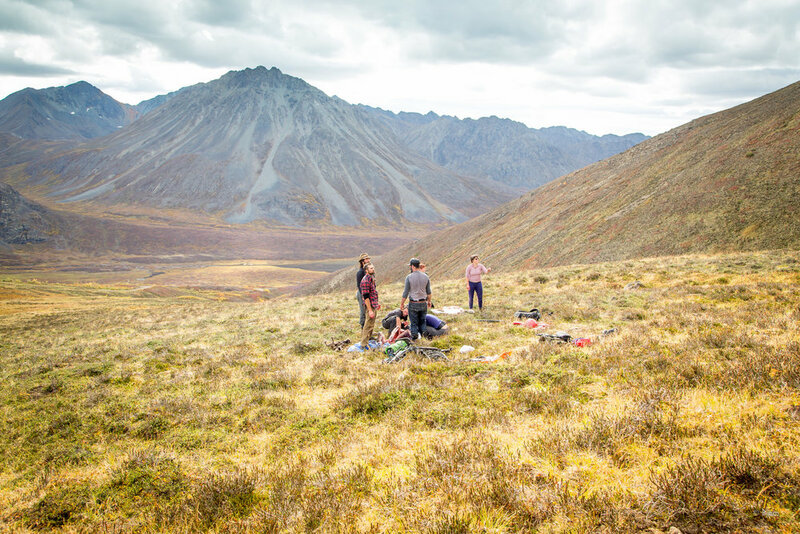 Kim, Alayne, and Daniel packraft in front of the Corwin Bluffs - Arctic Alaska. Kim rides the frozen Tustumena Lake. 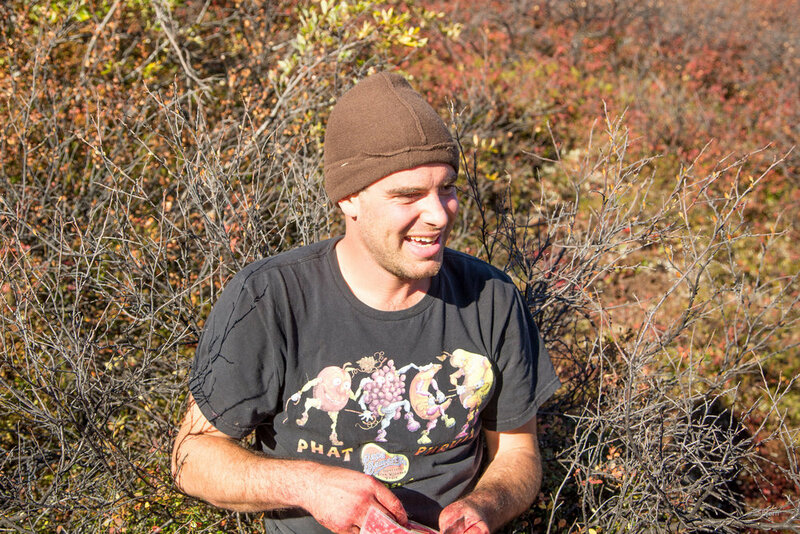 Bjørn finds a mammoth tusk - Arctic Alaska. 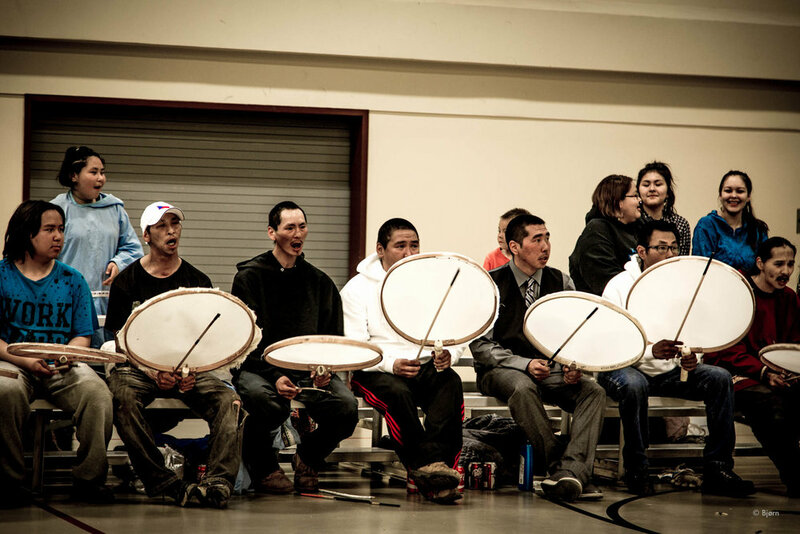 Kali dancers perform during the whale festival - Point Lay, Alaska. 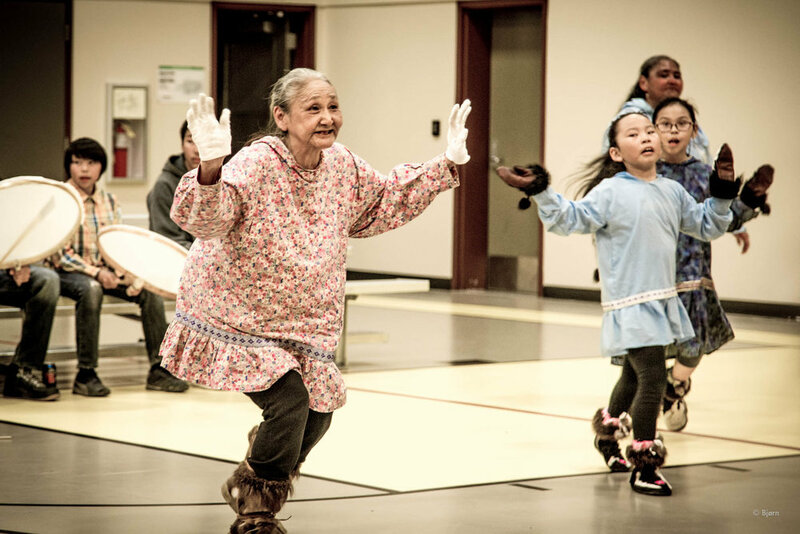 Kali dancers - Point Lay, Alaska. Spotted seal pup - Arctic Alaska. 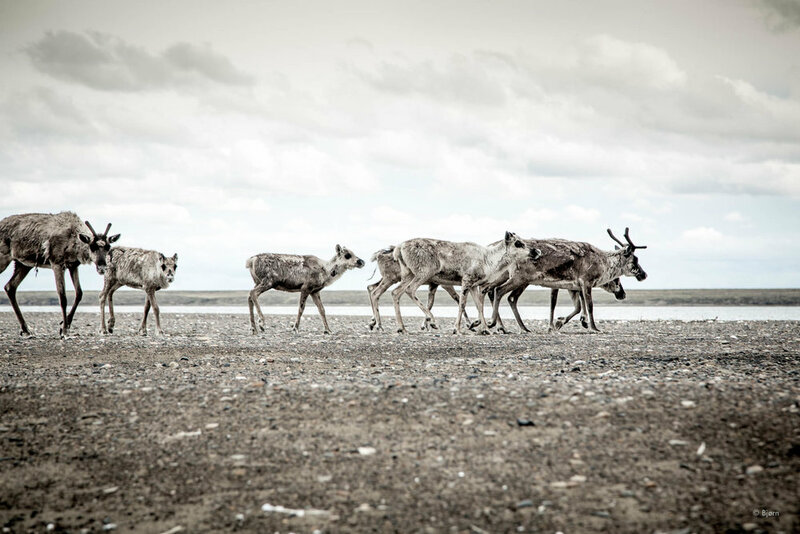 Caribou on the Kasegaluk Lagoon - Arctic Alaska. 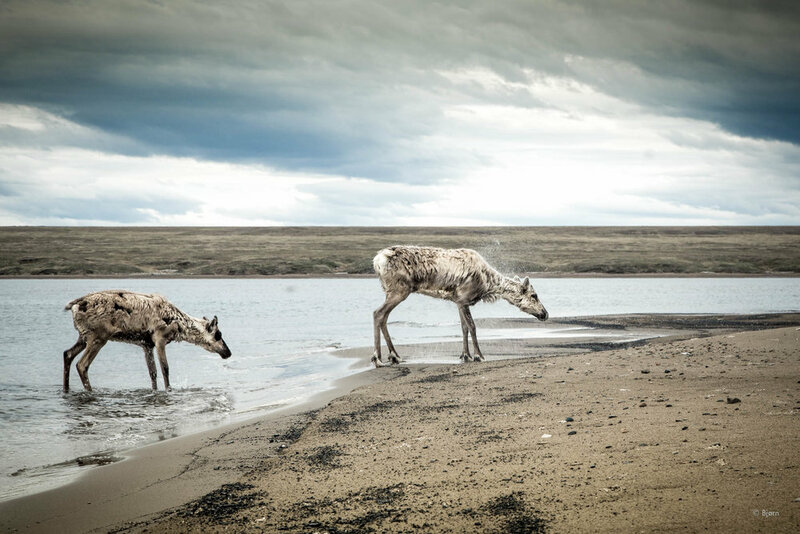 Swimming caribou - Arctic Alaska. A retired umiak - Wainwright, Alaska. A sod hut - Arctic Alaska. 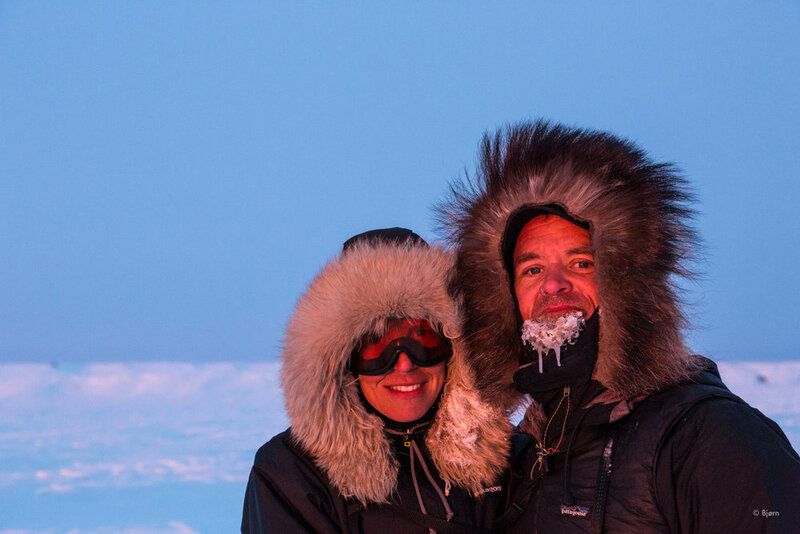 Bjørn and Kim finish their expedition to Utqiagvik, Alaska. 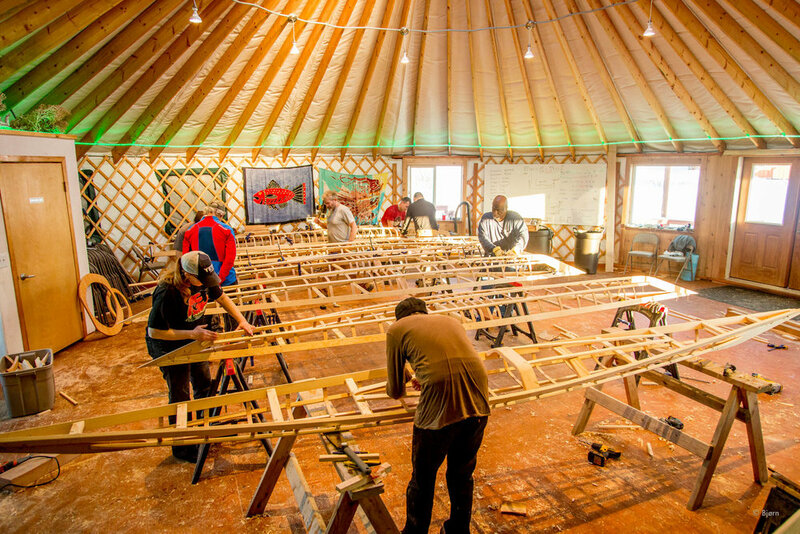 Traditional qayak building with Maligiaq - Homer, Alaska. Bjørn's traditional Greenlandic qayaq - Homer. 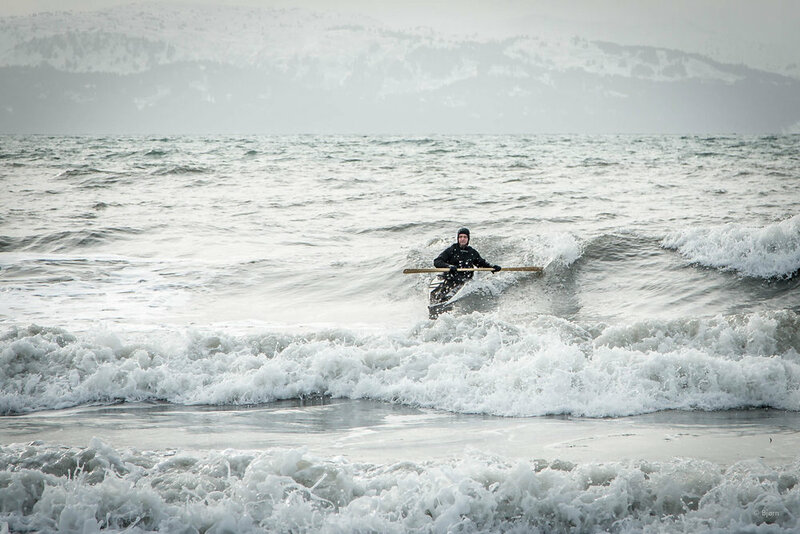 Bjørn surfing his traditional qayaq - Homer. Kim returns from a paddle with her traditional qayaq - Homer. Alaskans Know Climate Change tote bags. 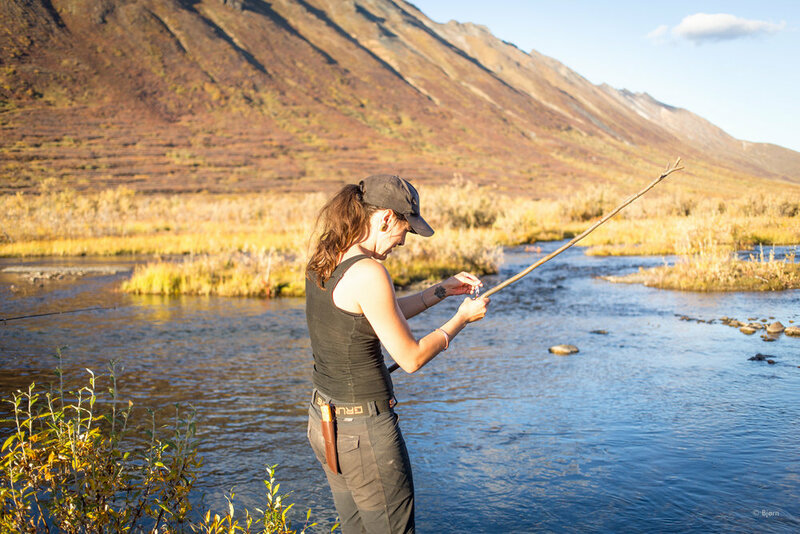 Kim dip-netting sockeye salmon - China Poot, Alaska. Munitions training before Arctic fat-bike expedition. 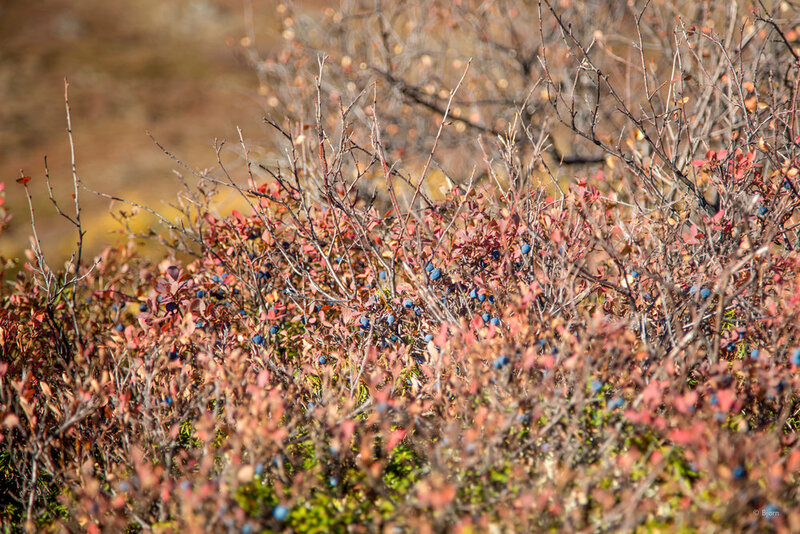 Katmai and Lituya harvesting berries - Seldovia, Alaska. Billy fishing for halibut - Kachemak Bay, Alaska. Doug fillets halibut - Kachemak Bay, Alaska. 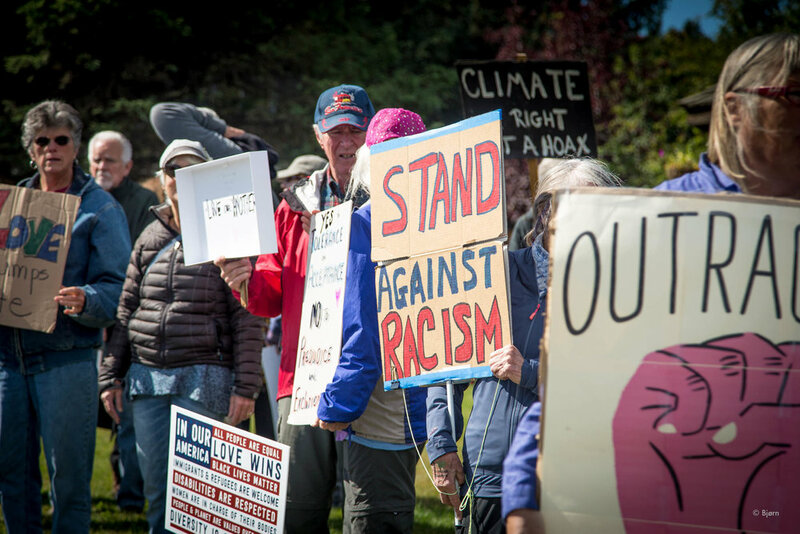 Homer residents protest against racism. 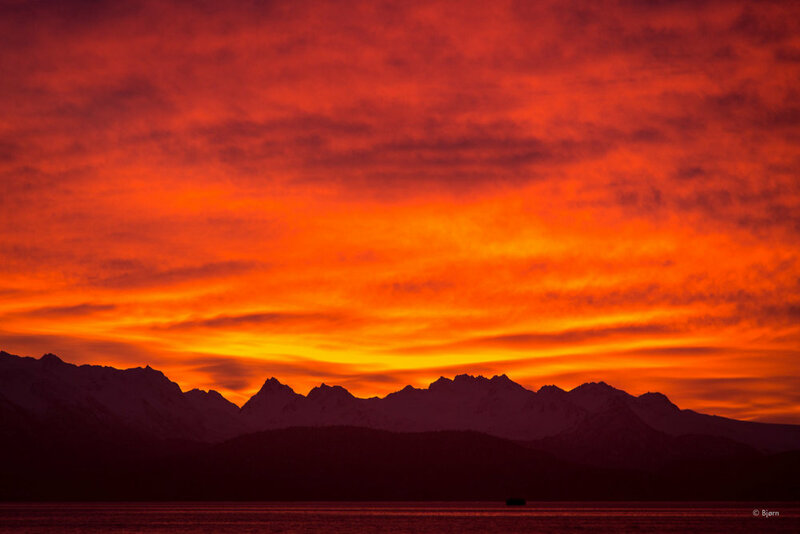 The Kachemak Bay Adventure Trail. Salsa Mukluk fat-bike in front of whale bones - Point Hope, Alaska. Lael prepares to launch on the Kachemak Bay Adventure Trail. 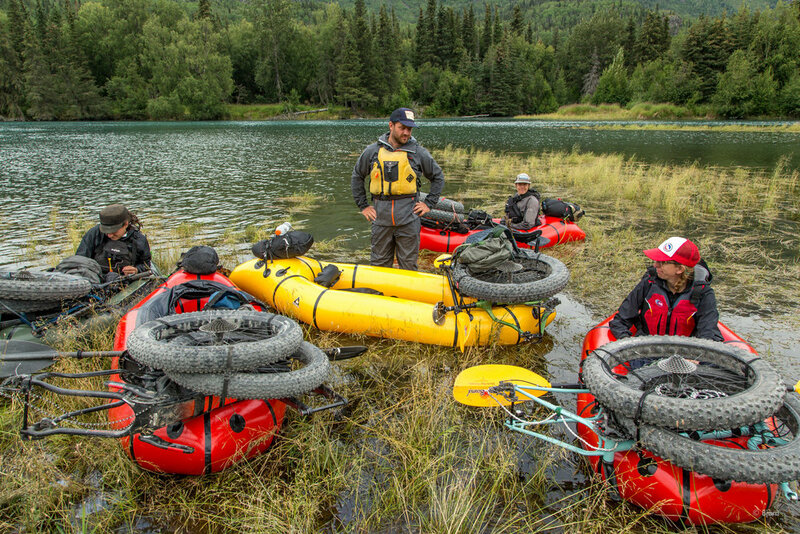 Packrafting to Aurora Lagoon along the Kachemak Bay Adventure Trail. 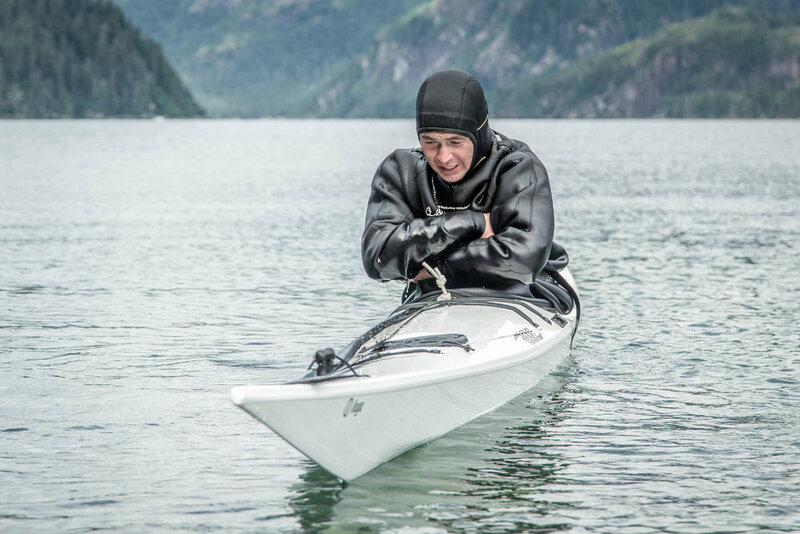 Maligiaq prepares for the most difficult roll - the Straight Jacket Roll - Resurrection Bay, Alaska. Alaskans Know Climate Change tabling - Homer. 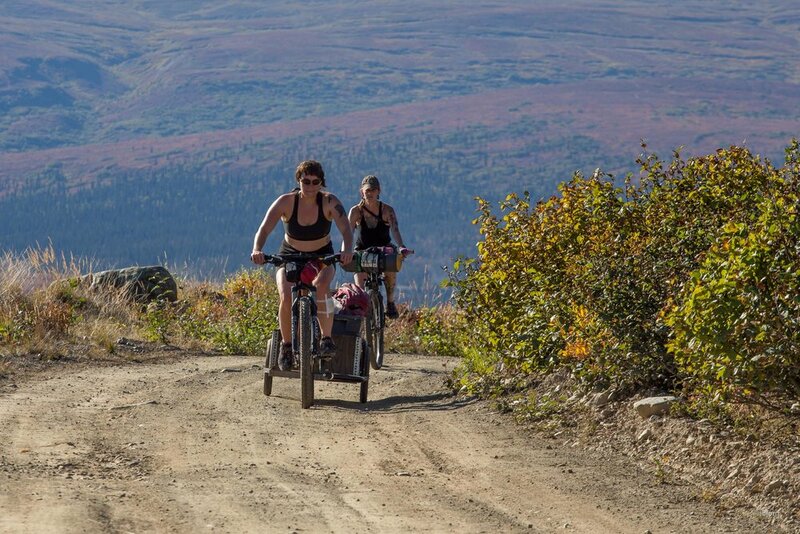 Beach biking toward the Lisburne Hills - Arctic Alaska. Big Fat Bike Festival obstacle course - Homer. Maligiaq returns to Seward - Resurrection Bay, Alaska. Margaret and Bjørn pause for sunset - Caribou Hills, Alaska. Sunset in the Caribou Hills. 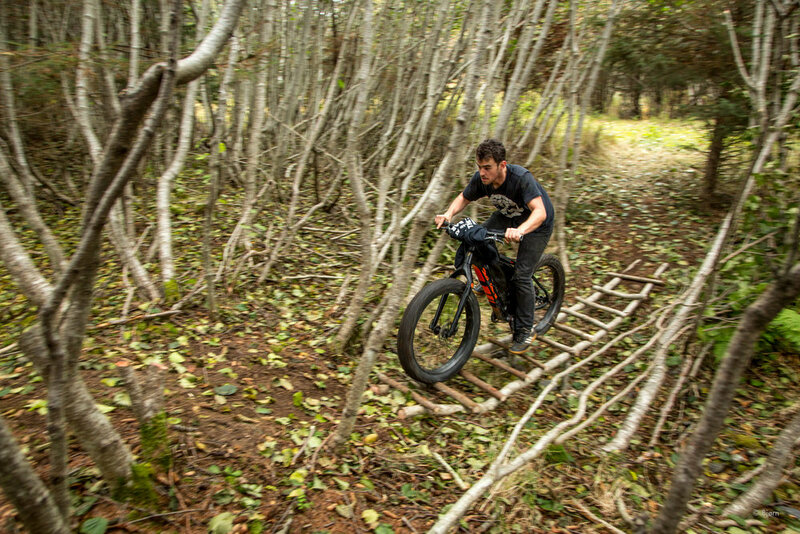 George rides through a deep creek - Seward, Alaska. March for Science, Earth Day, and Alaskans Know Climate Change event - Homer. The word Arctic, for me, is a magical word. As someone who lives in an Arctic state, I have spent relatively little time above latitude 66º. What time I have spent in the far north has further emboldened my romance. The land of no summer sunsets, bowhead whales, walrus’, shorebird colonies that darken the skies and ancient cultures surviving and thriving in the lands of their ancestors easily distract my mind. A quixotic vision compels me north this summer, but with a healthy dose of realistic expectation, and even more caution. 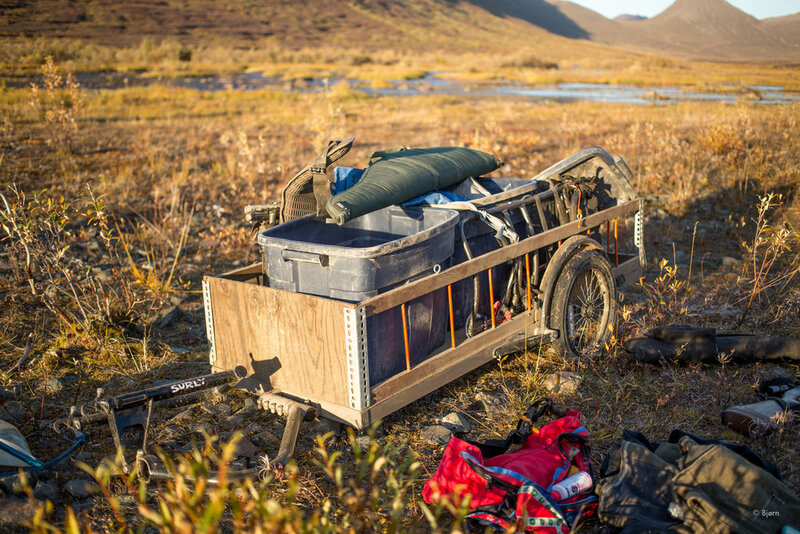 This summer, myself along with Kim McNett and Daniel Countiss will fly to the northwestern Alaskan community of Point Hope and begin a long, fat-bike and packraft trip. 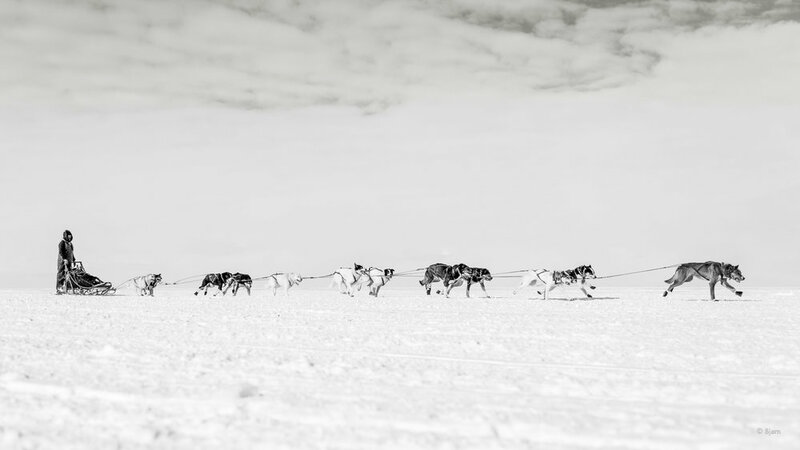 Our aim is to traverse more than 800 miles of Arctic terrain to Kaktovik in the northeastern region of the state. We will pass through the villages of Point Lay, Wainwright, Utqiagvik (Barrow) then continue east to Deadhorse; and, if everything goes incredibly well, we’ll continue on to Kaktovik. For the first ten-days, we will be joined by our friend Alayne Tetor. For months, we have poured over satellite data, photosets, and maps; and have reached out to any and everyone we know that has experience or who lives in the region. We have repackaged and stuffed seven-weeks worth of food into flat-rate priority mail boxes, to be sent to village post offices when needed, and assembled all the odds and ends one needs to survive while traveling unsupported in the wilderness. We’ve overhauled all the little parts and pieces of our bikes and stripped them down to single speed and single intention machines. Our bags are packed. Before any big trip, but particularly before a previously unattempted big trip, I hear the questions from friends and family: how long will it take, how many miles do you expect to travel each day, etc. My response is, we have seven weeks worth of food. We can make assumptions and guesses based off the information we have, but until we are actually there we’ll have no real or clear idea about our efficiency on this road-less and trail-less route. This uncertainty gives me butterflies. The giants of our imagination may turn out to be benign windmills or we may come home with our tails between our legs. Regardless, we are going…to find out. Beyond the straightforward adventure, we will also be attempting to contribute to the scientific community by documenting and measuring coastal erosion. Similar to geocaching, we will be attempting to locate the dozens of “shore stations,” which have been created by Shore Zone, with our GPS. Once we locate them, we will re-measure, photo-re-occupy, make field notes, and nature drawings. Some of the coastline we propose to pass through is losing more than 20 feet a year to erosion from the warming seas – a symptom of climate change. Arctic explorer Vilhjalmur Stefansson once said, “There are two kinds of Arctic problems, the imaginary and the real. Of the two, the imaginary are the most real.” From where we are standing, all Arctic problems are imaginary and therefore very real. 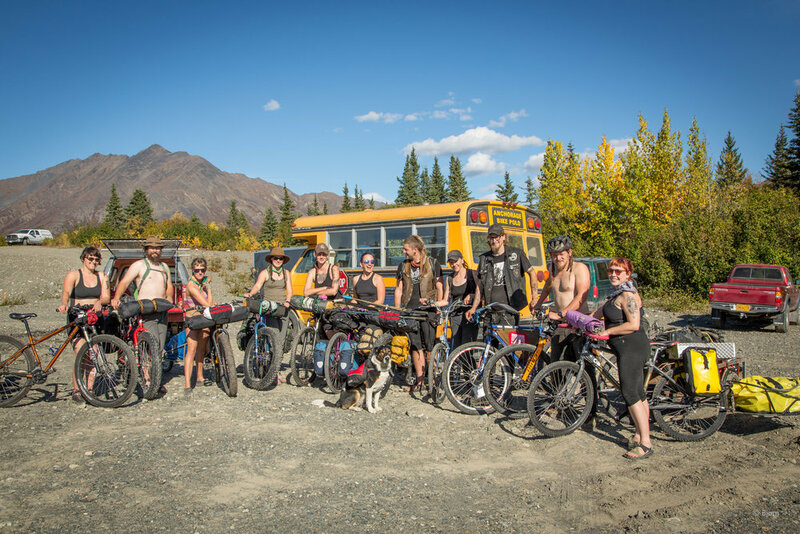 An enormous thank you is due to the brands and organizations that have helped us realize this expedition: Ground Truth Trekking, Cook Inletkeeper, Kachemak Bay Conservation Society, Salsa Cycles, Alpacka Rafts, Mountain Laurel Designs, and the Time Lords Cycling Group. MLD Duo-Mid shelter with bug netting. 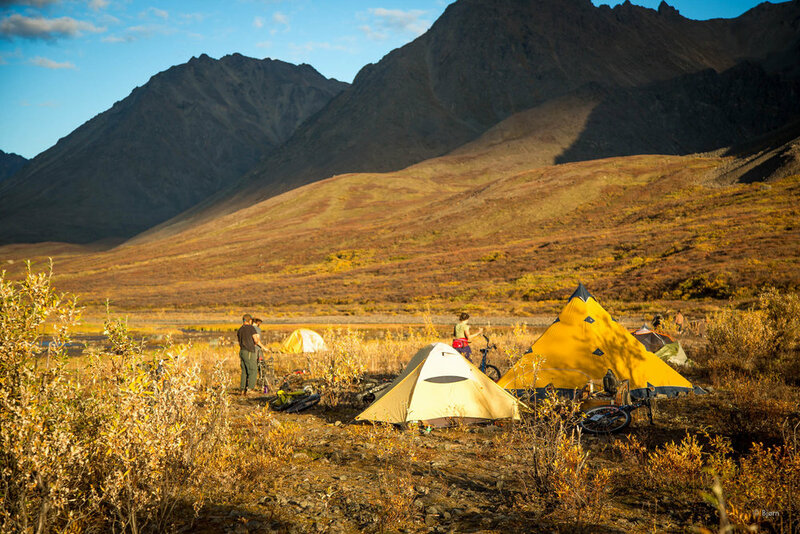 For our upcoming fat-bike expedition, across the roof of Alaska, we will be using Mountain Laurel Designs (MLD) duo-mid shelters. 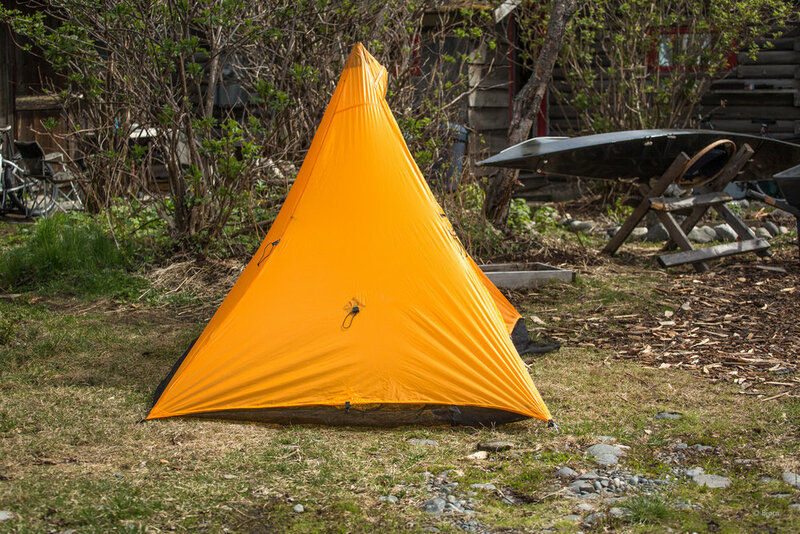 These are two-person, sil-nylon, floorless mid shelters, which weigh less than one-pound. 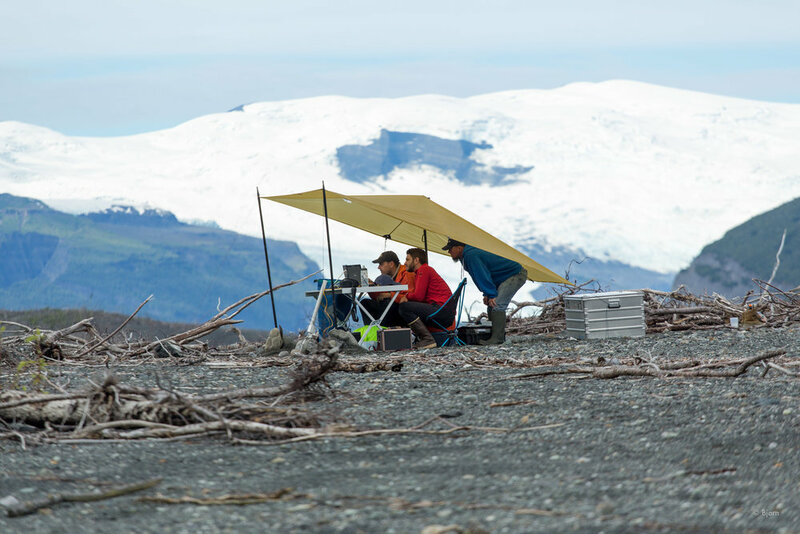 I have used these shelters in the past in a variety of terrain and climates and am fully confident they will perform expertly on our expedition. 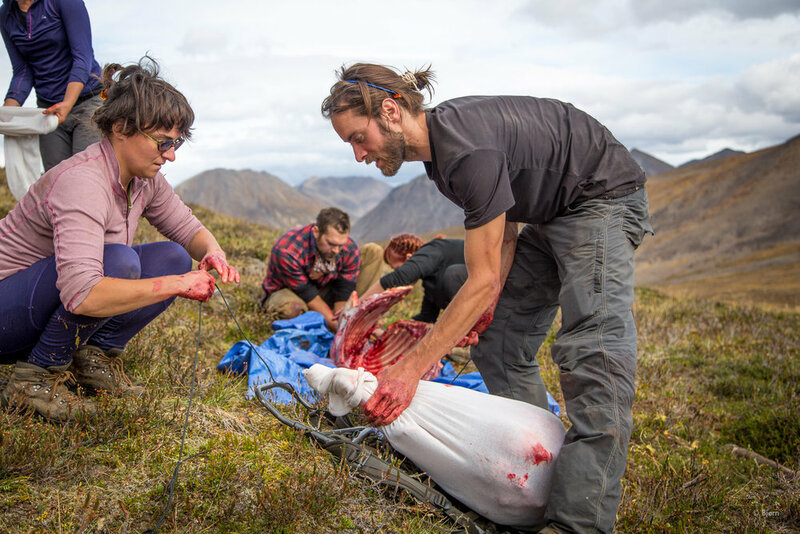 Floor-less shelters are quick to assemble, requiring four stakes or anchor points, which we often improvise in the field, and one center pole. Collapsible and lightweight center poles are commercially available but I typically improvise with something I am already carrying or find while underway. 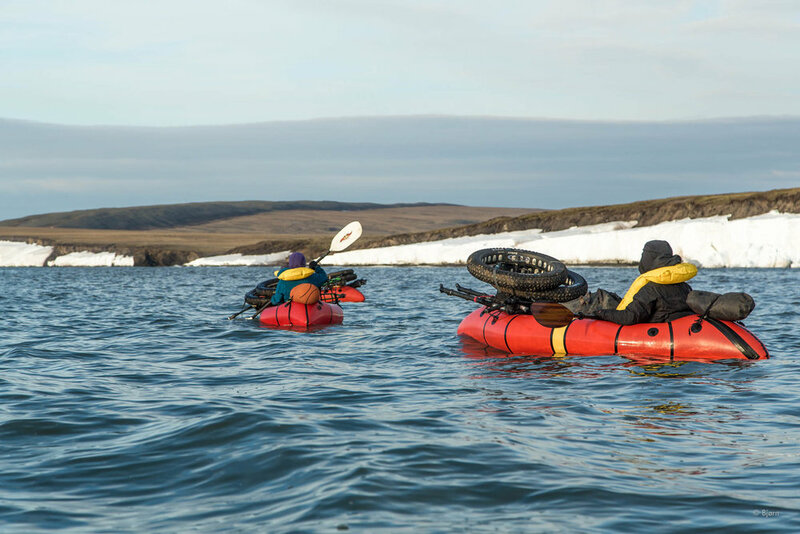 On this upcoming trip we will be using three-pieces of our four-piece packraft paddles. Nothing is lighter than nothing. 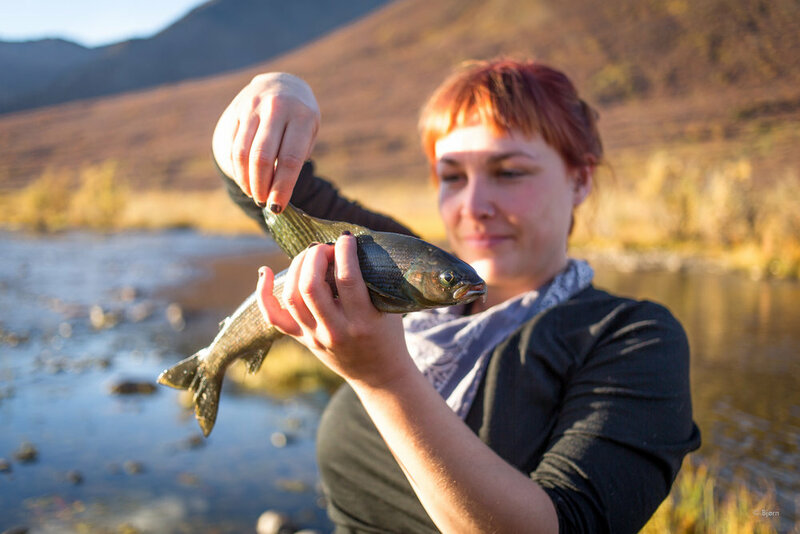 Many places in Alaska are famous for insects but the Arctic is especially famous for them. With that in mind, I decided to modify the shelters by adding an interior perimeter of bug netting. Ron Bell, from MLD, sent me a 48cm wide roll of netting, which I sewed on. I began at one end of the door and left about one-foot of extra to overlap at both ends of the entrance. Once I began, I sewed continuous, from door to door. The idea is that the netting will fold under the erected shelter and ideally no insects will be able to find their way under, through or in. My experience with mid-shelters, in buggy areas, in the past, has been hit-and-miss. I often try to burry the perimeter of the shelter but this only works in certain terrain. If the bugs are really bad, this technique only slows them down. By adding this skirt of netting, tucking it under the shelter then anchor it down by sleeping atop it and weighting the rest with gear, I believe we may win this particular arms race. 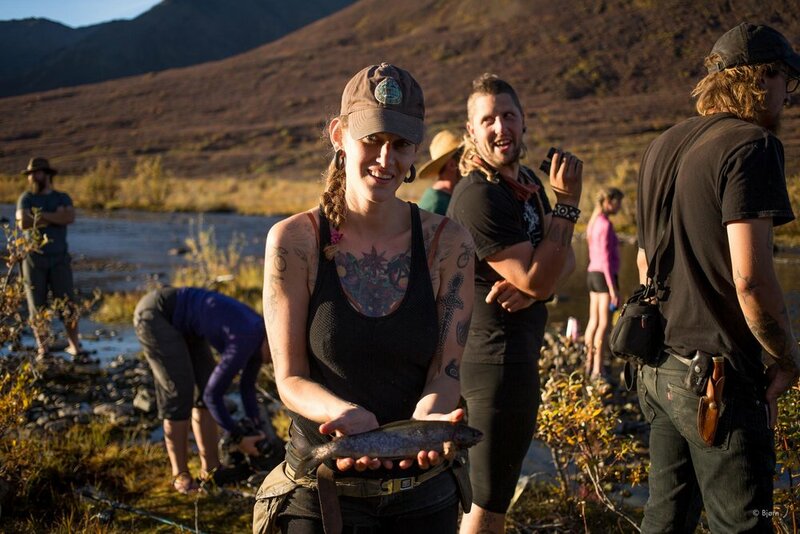 2016 has been a glorious year; full of Alaskan adventure, interesting and engaging work, old friends, new friends, family, community, learning, loving, and rich engagement with the natural world. Thank you to everyone who has helped enrich my life over the last 12 months. Bob was ending his Iditarod ride just as Kim and I were beginning ours. 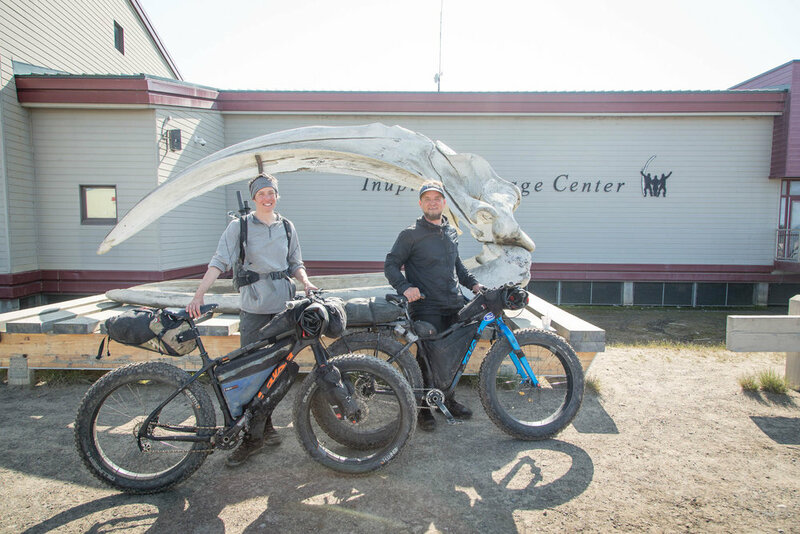 March, 2016 - Kim and I left Nome and bicycled to Kotzebue and onto Kivalina. Buckland residents, Glen and Viola sat out a storm with us in the Gallahan shelter. Paddling in front of Gore Point. Kim and I kayaked from Homer to Seward and then fat-biked and packrafted from Seward back to Homer. Bike/Rafting from Seward back to Homer, with friends. Maligiaq rolls his kayak in front of Portage Glacier.